The Greater Boston area, encompassing the eastern third of Massachusetts, is a playground for the American history enthusiast. 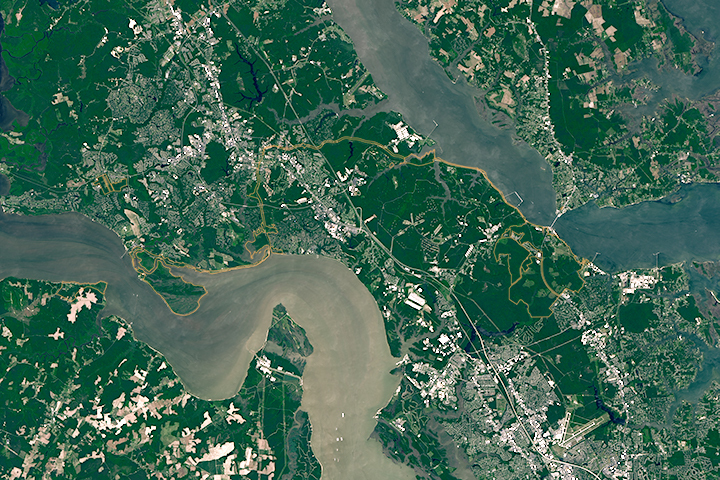 Sites important to the American Revolutionary War are interspersed throughout the modern-day metropolitan region; the view from space shows how preserved historic landscapes coexist with the new. 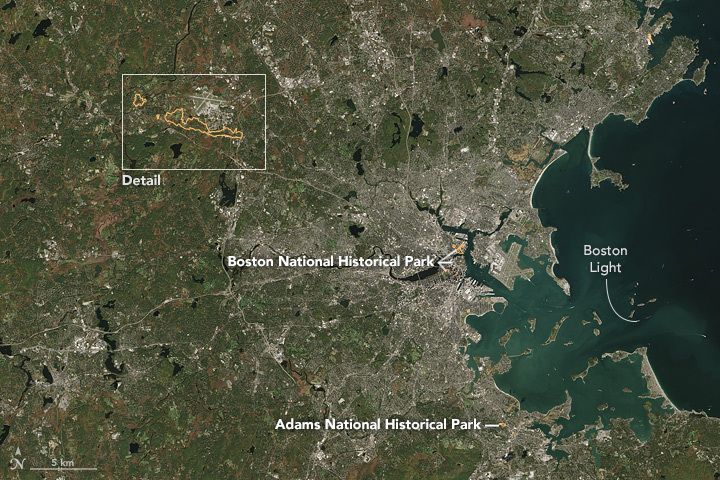 The top image shows a wide view of the area, from Boston Harbor to Minute Man National Historical Park. 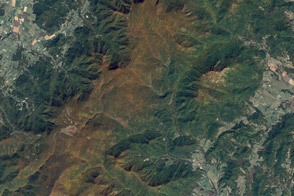 The natural-color image was acquired on October 15, 2015, with the Operational Land Imager (OLI) on the Landsat 8 satellite. In December 1773, American colonists protested British taxation and regulation by dumping hundreds of chests of tea overboard from merchant ships into Boston Harbor. The series of events that followed—including the march of British troops westward to confiscate a cache of weapons—culminated in battles in the towns of Lexington and Concord. 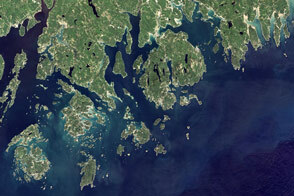 The battles marked the start of the Revolutionary War in April 1775. 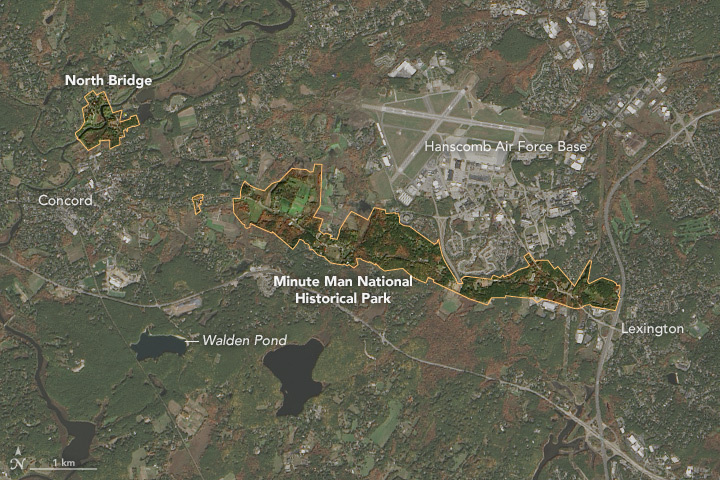 The conflicts near Concord and Lexington are memorialized at Minute Man National Historical Park, shown in detail in the second image. 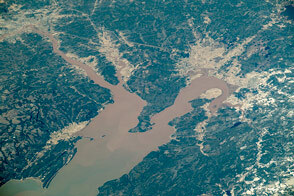 By the 1950s, the area grew crowded with roads and suburban growth. Gas stations, restaurants, and an airfield all cropped up in an area that was once farmland and open fields. The park was established in 1959 in part to protect the historic landscape from further development. Route 2A cuts through the park and Hanscom Field still stands as a nearby reminder of 20th Century modernization. In 2003, the National Trust for Historic Preservation listed Minute Man National Historical Park and nearby historic sites as one of the 11 most endangered historical places in the United States. Steps have been taken to restore historic structures and to return the landscape to one that more closely resembles the look and feel of the 18th century. For example, many power lines have been removed; stone walls have been rebuilt; and agricultural fields have been opened up. In 2009, the park boundaries grew to include the now-restored Barrett House and its surrounding farm, an important landmark of the war. Sites relevant to the start of the American Revolutionary War are interspersed throughout the modern-day Boston metropolitan region. National Park Service (2016) Minute Man National Historical Park, Massachusetts. Accessed July 1, 2016. National Park Service (2016) Minute Man National Historical Park: Disturbed Lands. Accessed July 1, 2016. National Parks Traveler (2012, November 9) Farm Dating To Revolutionary War Added To Minute Man National Historical Park In Massachusetts. Accessed July 1, 2016. NPS History Battle Road: No Turning Back? Accessed July 1, 2016.